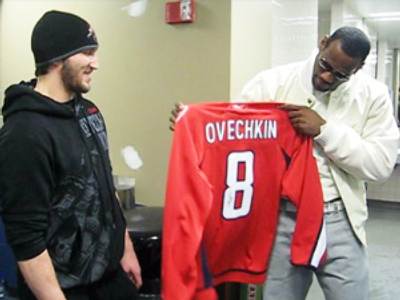 Despite being two of the world’s top sports celebrities, basketball all-star LeBron James and multi-million dollar hockey player Alexander Ovechkin had never met before Thursday night. The event took place in Washington, where James’s Cleveland Cavaliers clashed with the Washington Wizards. After the game Alexander the Gr8, accompanied by his teammate Nicklas Backstrom, and Ted Leonsis, who owns both Ovechkin’s team the Washington Capitals and the Wizards, headed to the visitor's dressing room. According to NHL’s official website, Ovechkin didn't say much during the meeting. Leonsis did most of the talking, first introducing Ovechkin and Backstrom to the global basketball star. 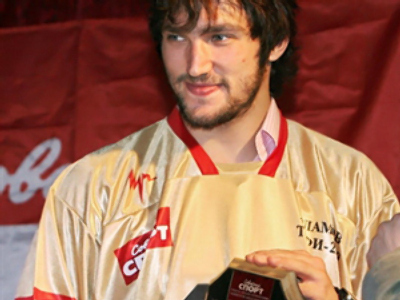 LeBron reportedly called Ovechkin ‘Prime Time’. “God… I don't know how you guys do that, sliding on the ice and still hit the puck? Whooo,” LeBron remarked. LeBron also confessed he had never been to a hockey game, so Leonsis offered to take him to one. “I heard they're amazing,” LeBron said. Both seemed to be pleased with the meeting.